With my bench built, the workshop is slowly coming together. Getting this done 30 minutes or so at a time, over lunch, for a bit after work before dinner. Going to raise that dutch tool chest about 10″ off the floor, which will have it with it’s lid open coming up just under the saws. Have another tool chest I haven’t figured out whether I’m going to move out here or keep in the house. That chop saw has to go elsewhere. 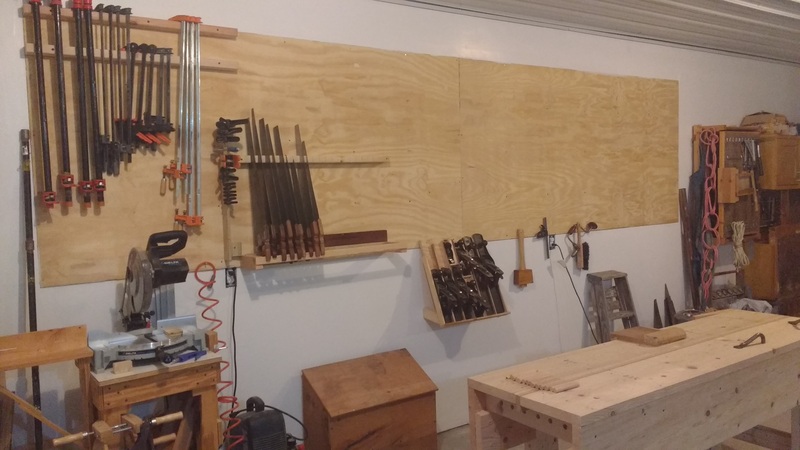 I think a chisel rack to the right of the bench planes, where my mallet is hanging in this photo. Perhaps auger bits and braces to the right of that. Think I’ll put the lathe just out of frame, also on the right, in between my new bench and my father’s work bench. Decisions and planning. Very good times. Hang up your posters of Farrah Faucet. Haha just joking.